Last weekend, our darling neighbour Michelle had a baby shower. Little Arturo (our current working title for her bump) is expected to make an appearance any day now and we’re very excited for her and Shaun! Early on Sunday morning, I consulted my copy of The Flavor Bible. This fabulous tome isn’t a cookbook, but rather a detailed study of how we perceive and taste food, accompanied by comprehensive lists of different ingredients and their recommended pairings. I read recently that it’s a favourite with chefs, who will often refer to it when creating new dishes. 1. Preheat oven to 160C with fan and line a baking tray with parchment paper (I used a rectangular 30cm x 23cm / 12″x9″ pan enamel baking pan). 2. In the large bowl of the food processor, blitz together the butter, sugar and lemon rind until light and fluffy. Add the eggs one at a time and pulse until combined, adding in a spoonful of the flour if required to stop the batter from splitting. Scrape down the sides as needed. 3. Stir together the flour, almond meal and poppy seeds, then add to the food processor and pulse until just combined. Scrape the batter into the prepared tray. 4. Bake for 30 – 40 minutes, or until a fine skewer inserted comes out clean. Rotate the tray half way through the baking time if needed. Place on a wire rack to cool, but don’t lift the cake out of the pan. 5. Once the cake has cooled, sift the icing sugar mixture into a large bowl, and gradually whisk in enough lemon juice to form a fairly thick but pourable icing. Drizzle the icing over the top of the cake, and spread evenly with a spatula or butter knife. Like the pound cake recipe, our basic tea cake formula is proving to be extremely versatile – this is now its fourth incarnation, and each one has been distinctly different to the others. Pete decided that he would have preferred a straight lemon cake without the poppy seeds, but everyone else loved this! Cecilia I have the 1977 Moosewood Cookbook – it has a recipe for Ukrainian Poppyseed Cake. I’d be happy to type it out for you if that’s the one. Sending it to you now Cecilia. I love the lemon and poppy seed combo…one of my fave’s! I noticed when we were in Aus…bake shops and cafes were more likely to have orange poppy seed which I feel is just WRONG :) gotta be lemon! Mmmm! Lemon and poppy seed cake! The cake looks delicious! Will have to try it. Need to bake a cake soon for an event and I think I will make this. Thanks for sharing! Manuela, the base cake recipe is so easy that you could really adapt it to anything you have on hand! Of the four versions I’ve now made, this one and the passionfruit and ginger one have proven the most popular! Celia, I made a lemon poppy seed cake not too long ago, simple, with yogurt in the batter…. I think the combination of lemon and almonds + poppy seeds is hard to beat…. as usual, you did a wonderful baking job! Maz, Pete REALLY like the glaze – these days cakes seem to be topped with buttercream frosting, but this simple old fashioned icing is really nice for a change! Looks like a lovely way to use up our lemons, will definitely try this! Gail, it’s been a great lemon season, hasn’t it? I adore that book, Celia, and always have it on hand in the kitchen. It’s probably one of the best books I’ve bought in the last 12 months. Isn’t it great, Amanda? It’s been a great help when we’ve tried to work around ingredients we have on hand. Celia anything with lemon in it is my thing, this one is going on my Celia List. Get out of my head with that book! I have been googling “flavour” and “taste” of late, now you’ve linked me to an entire book of what I want to know. Thank you dear girl. Well now this sounds like a yummy combo Celia… I have plenty of lemons right now, so might just give this a crack! I love poppy seeds, always have! And that book! I am going to check ebay and the BD now! Beautiful cake Celia, on this chilly day am inspired to get my baking mojo on! Had lost it for awhile, but my lemon tree is absolutely groaning with beautiful lemons!!! But, first to browse through book sites to find the book you show in your blog!!!! Hasn’t it been a wonderful season for lemons! We’ve never had this many before, but our tree is STILL full! On a cold rainy winter’s day, what could be better than the warmth of an oven and the scent of a baking lemon and poppy seed cake. I’m in the kitchen again Celia after having to stop working due to an accident. It’s been a long journey but I’ve now realised, after 4 years, my time is my own and I have always been an old hippie at heart. I enjoy every day like a big kid. Thank you for your blog and this beautiful recipe. Fresh cream on top! Yum. Celia, I have a tip for quick lemon zesting. To save time (and to avoid scraping my fingers) I peel the lemon zest with a potato peeler and blitz in a processor with the sugar. Great idea, especially when zesting a lot, thank you! Tandy, that’s the second mention of the Thesaurus, I’ll have to check it out, thank you! Ooh that looks good – a proper old fashioned cake! Tanya, that’s what Pete said too! He liked the old fashioned icing! Love the blue plate and the cake looks delicious. Thanks Madge! The blue Turkish plate is one of my favourites! Wonderful, Celia. Love fresh homegrown lemons (so fragrant!) and this cake looks simply delicious. Yum! I love lemon and poppy seed as a combo – think I shall have to check the cupboards to see if I have enough poppy seeds on hand. Your flavour bible sounds like a brilliant book. Have a super week ahead Celia. What a lovely cake for a party! I just made GF lemon poppy seed muffins for a baby shower on Saturday — I’m a big fan of lemon anything, so your tea cake works for me! Lovely looking cake and I love how you have adapted your recipe for Raspberry and Quince Jelly Tea Cake to accommodate the delicious pairings of lemon, poppy seeds and almonds. I had forgotten about the Flavour Bible and Tandy’s mention of the Flavour Thesaurus has piqued my interest. Off to Amazon to see what I can find! Looks wonderful Celia, I’m very partial to seedcakes, would love to try this one. Andrea, I usually make savoury things with the poppy seeds, so it was a nice change! Hope you get to try it – it’s a very easy tray bake! All my favourite ingredients in this cake- its on my list for when i return. Celia aren’t the enamel ware pans excellent for cooking cakes? They are my go to ones now, love em’! This looks so simple to make but the texture of the cake looks fantastic! Hi Celia!!! Your cake looks delicious! It is the kind of cake I love the most: not heavy, soft and tasty! And the combo lemon almonds and poppy seeds sounds great :)! Thank you very much for sharing this beautiful recipe! I have never heard of this book before but I think it is worth that I go and buy it now :)! Can i find it in every book store or should I buy it on the internet? Also, I just opened my little food blog, so if you cold find the time to come and say hallo I would be more than happy :)! Hi Ema, congratulations on your new blog, hope it goes well for you! 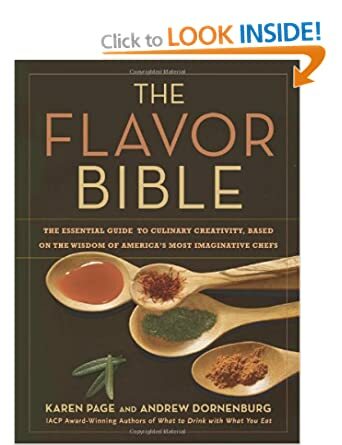 I buy almost all my books through Amazon these days, which is where I got my copy of the Flavor Bible. Thank you Celia! I’ll buy it on Amazon then :)! Hahaha…yes, apparently too many poppy seeds can lead to folks failing drug tests! I love the sound of The Flavor Bible, wouldn’t that make for an interesting book club project. Lemon, Poppy seed and especially almond meal are my very favourite ingredients in cakes, so this one is going on my ‘have a go list’. Jan, it’s a surprisingly good combo – hope you and Peter like it as much as I did (my Pete less so, but then he’s not a huge poppy seed fan). I combined poppy seeds once with candied orange peel in a cake and that was delicious too. Putting this on my to-make list. Thanks! Candied orange peel sounds like a wonderful addition, thanks for the great suggestion! I made the basic tea cake tonight for my Stitch group – topped with homemade quince/rhubarb jam and a drizzle of maple syrup. A hit! Tried to tag you on Twitter, but couldn’t find your handle. Are you still hanging around over there? I haven’t had poppy seed cake in ages and this one looks delectable. But to make it from your own fresh picked lemons…oh wow!